OpenTuition provides the study resources you need to enable you to pass Paper P1 – all free of charge. Given that June 2018 is the last exam session for P1, P2 and P3, there is even more reason than usual to make sure that you prepare to pass. Becker Professional Education has very kindly provided OpenTuition with mock exams (questions and answers) for each of these papers. 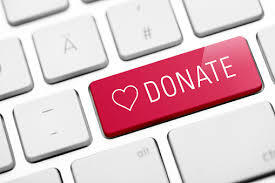 You can download them using the links below. Please note that we cannot provide mock exams for other papers and we do not provide a marking service. 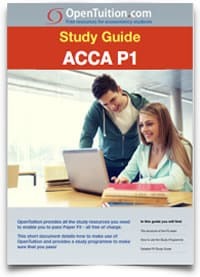 To begin your studies, download our free Study Guide for ACCA Paper P1 and find out how to make use of OpenTuition to make sure that you pass! OpenTuition lecture notes are used regularly by thousand of students and many colleges worldwide. 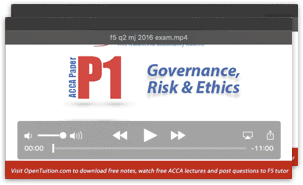 To fully benefit from these notes you should watch our free P1 lectures. Our free lectures are a complete course for Paper P1 and cover everything needed to be able to pass the exam well. To fully benefit from our free P1 lectures you must also use our free lecture notes while watching the lectures. Practice key terms and concepts using our P1 flashcards! It remains a three-hour paper, with 15 minutes reading time. 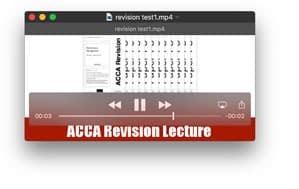 If you have watched our lectures and are still struggling with some concepts, you can post your questions to ACCA P1 Tutor on our Forums.